Afghanistan’s first lady lives behind a formidable barrage of security in the presidential palace in central Kabul.�It took five security checks, each more rigorous than the one before, to reach the ground-floor apartments which are currently home to her, her husband and their two young children.�It is clearly a situation which poses big challenges to everyday family life. Zinat Karzai’s lack of visibility has prompted criticism from some Afghans, especially the younger generation, that she is not doing enough to stand up for women’s rights and to set a positive example. All the more so, her critics say, because she is a qualified doctor who before her marriage worked for some years in Pakistan.�“I know [my contribution] is not open and visible in the media,” she says firmly. “But I’ve done what I can and what I know it’s possible to do given the current circumstances in Afghanistan.”�When she talks about current circumstances, Mrs Karzai is not just talking about security issues. Despite being out of the public eye, Zinat Karzai has met a number of other visiting first ladies.�She numbers Cherie Blair, Laura Bush and Gursharan Kaur, the wife of Indian Prime Minister Manmohan Singh, among the first ladies she admires. 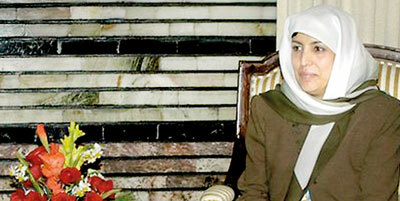 She is also close to Iranian President Ahmadinejad’s wife, Azam al-Sadat Farahi, whom she speaks to on the telephone. Zinat and Hamid Karzai have been married for 14 years, and since she became first lady she has had two children. Her son Mirwais is now six, and she has a baby daughter called Malalai.�She says President Karzai dotes on the children, although he struggles to make time in his packed schedule to spend time with them.�“Sometimes, perhaps on Fridays, he might be free for an hour or so,” she says, “so he will go for a walk with me and the children. We all go out together – once in a while.” President Karzai has in the past spoken emotionally about the kind of Afghanistan he hopes his son will grow up in. For many Afghan families, a daughter is seen as less valuable, but Zinat says President Karzai is equally ambitious and hopeful for his daughter.�“For us� there is no difference between a boy and a girl,” she says. “A daughter is the best gift from God.”�Like her husband, Zinat Karzai has a keen eye for clothes and has cultivated what she calls an Afghan style of dress. For the BBC interview she was wearing a light green long dress and matching head scarf. While for many outsiders the burka is a symbol of the lack of freedom many Afghan women still experience, Mrs Karzai maintains that it is not actually part of Afghan tradition at all. “The burka� is imported from abroad,” she says. “In rural areas the majority of women just wear a big headscarf. This is Afghan dress.” Looking back to her own childhood, Zinat Karzai remembers with affection her father who worked in the education ministry and pushed all his daughters to study.